Each replica fireplace provides a symbolic accessory for the Christmas season, a perfect place for hanging stockings and taking holiday photos. 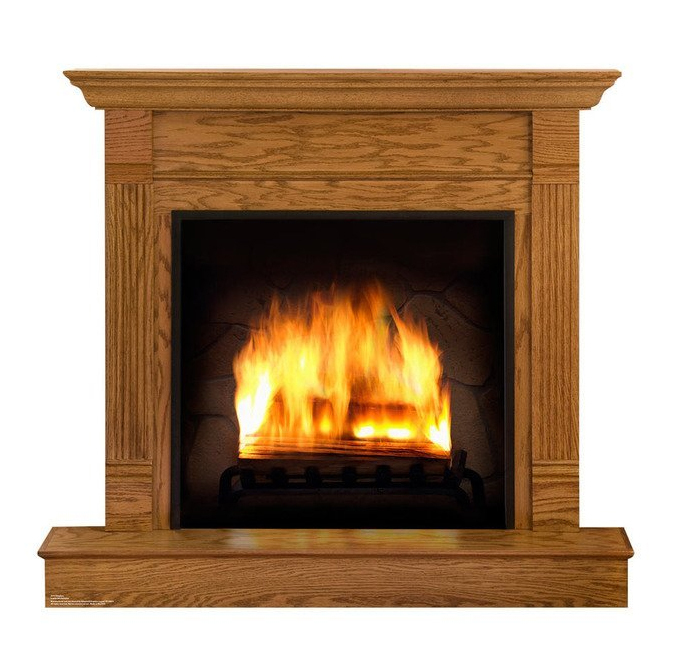 Most three-dimensional cardboard fireplaces have the distinct advantage of being able to place lightweight decorations on the fireplace mantel, that is, the top of the cardboard fireplace. Because a 3-dimensional cardboard fireplace extends into the room, they have the depth of a real fireplace. They can also fold flat for storage for another year. If you plan to hang more than empty stockings, you may need to counterbalance these 3-dimensional fireplaces by placing something heavy (like a couple of bricks) into the back of them. This free-standing cardboard fireplace by Corobuff is four feet wide. The recessed firebox portion, where the “fire” is located, is 17 inches wide and 15 inches high. You will have to assemble it by folding and fastening it. Securing it with binder clips or tape, instead of the included clips, improves its sturdiness. 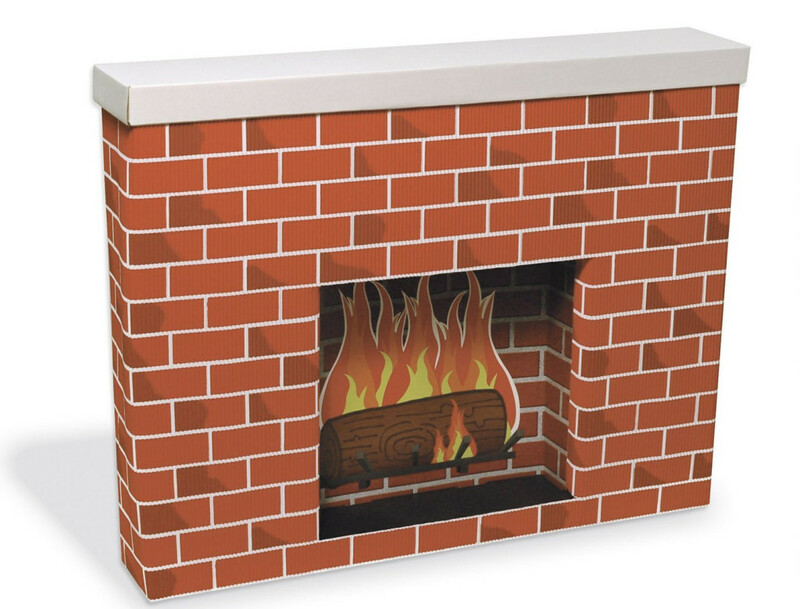 At 3 feet, 8 inches wide and 3 feet tall, the Shindigz 3-dimensional sturdy cardboard fireplace is 10 inches deep. The “fire” is a separate piece that sets in the recessed opening, so those who want to replace the flames with something else (such as battery powered LED candles and LED fairy lights) can do that. Assembly is required, and taping helps keep the corners squared. 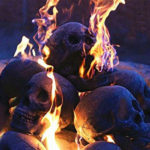 You can use LED fairy lights to create a glow in the firebox of the Shindigz fireplace. Some free-standing cardboard fireplaces have side “wings” that fold, similar to a tri-panel fireplace screen, to support the cardboard. Other free-standing cardboard fireplaces have a back support to keep it upright. 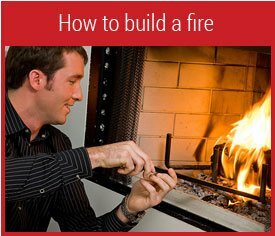 Their main advantages over 3-D cardboard fireplaces are that they assemble more quickly and don’t extend into the room. Attaching stocking to them can be more complicated, however, as they cannot hold much weight unless you firmly attach them to a wall. The Beistle Folding Stand-Up Brick Fireplace is three feet wide and 25 inches tall. It comes with cardboard mini-stockings or without the stockings. 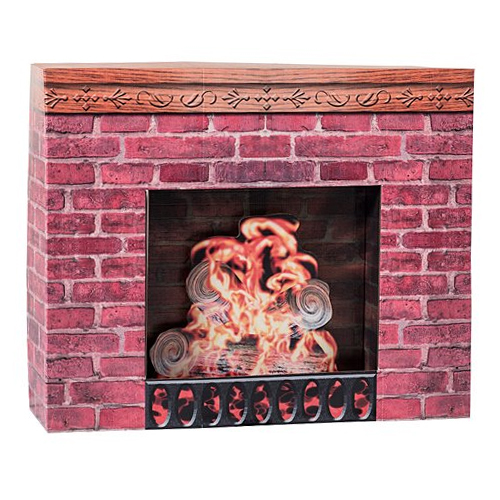 Folding Cardboard Fireplace also available with ten 7.5 inch stockings printed on both sides. 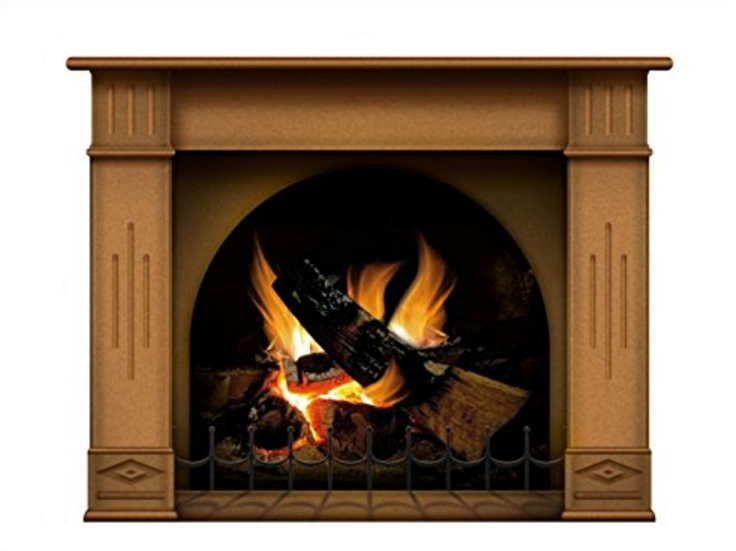 One of the largest cardboard fireplaces, the 49 inch tall, 44 inch wide Advanced Graphics Life Size Fireplace has a cardboard stand in back that holds it upright. Attach it to a wall if you plan to hang filled stockings from it. These peel-and-stick decals are typically made of 3M vinyl. 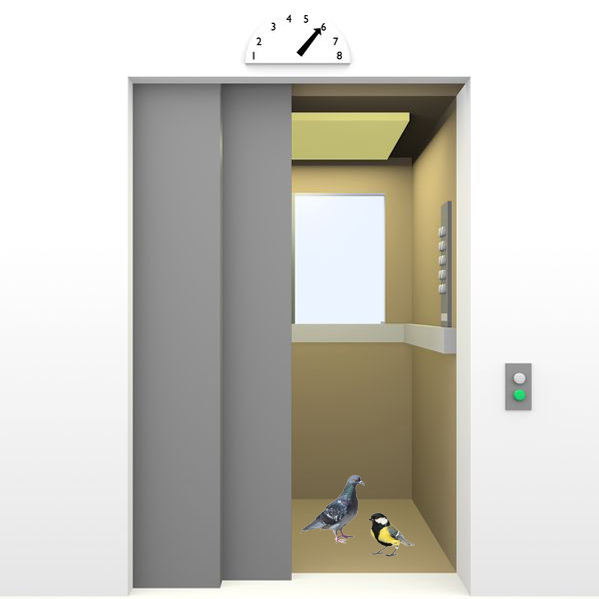 They can only be used on smooth surfaces, but they are safe to used on painted walls. 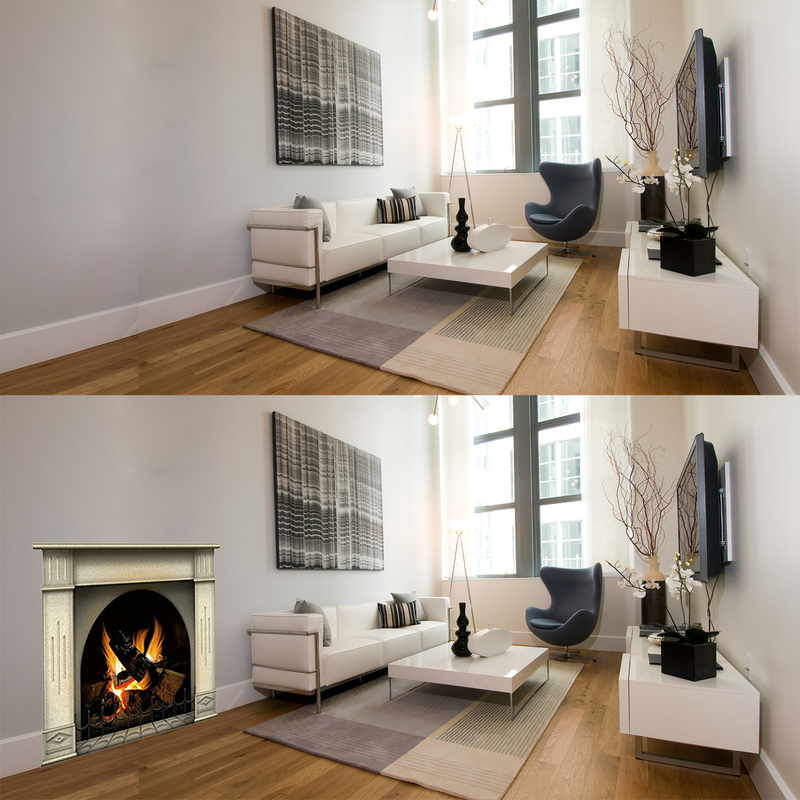 Many are smaller than most actual fireplaces. To hang stockings, consider using Command hooks sized to the weight of your filled stockings. 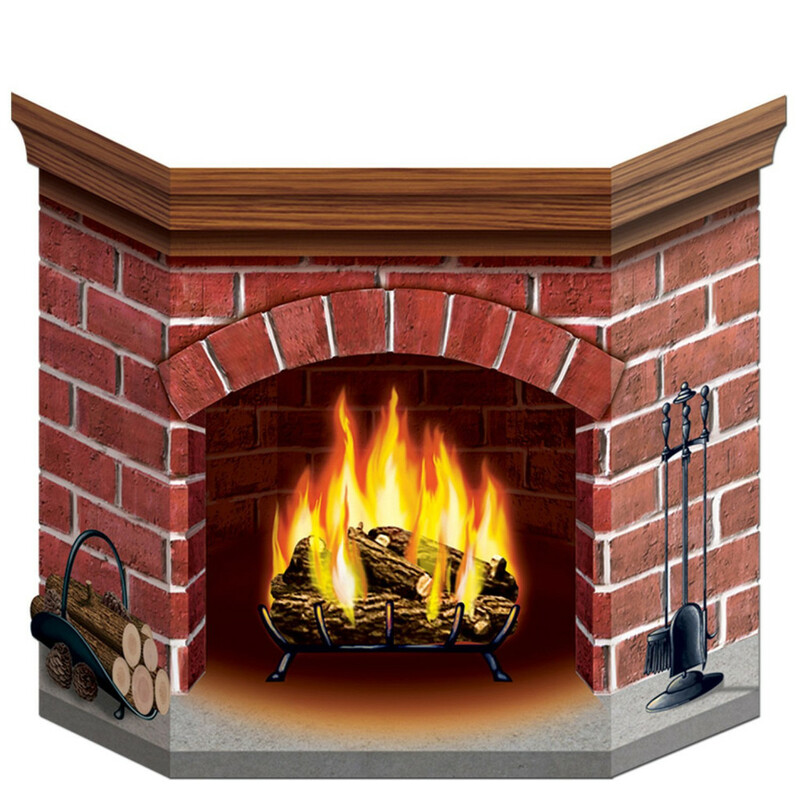 One of the few vinyl decal fireplaces that are as large as most fireplaces, the Fathead Fireplace Wall Decal is 47 inches wide and 35 inches tall. 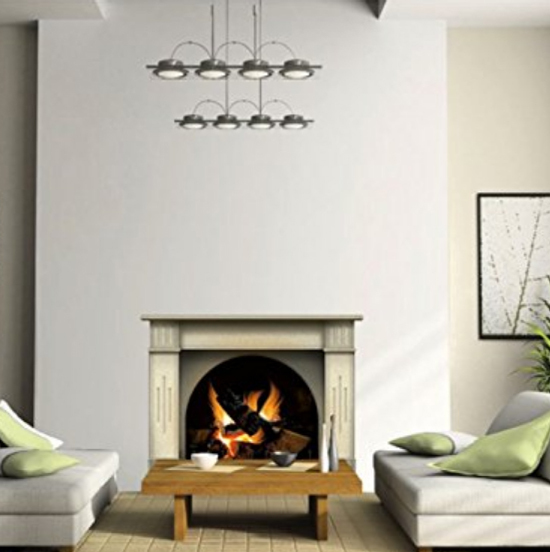 It is a classic white fireplace with a warm fire, appropriate in most every room’s style. 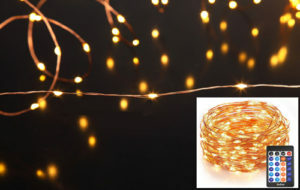 Hang a wreath above it, and you have instantly decorated your room for Christmas. Although more expensive than other fireplace vinyl wall decal stickers, unless your space is very limited, it is more likely to give you the effect you wish than the smaller fireplace decals. 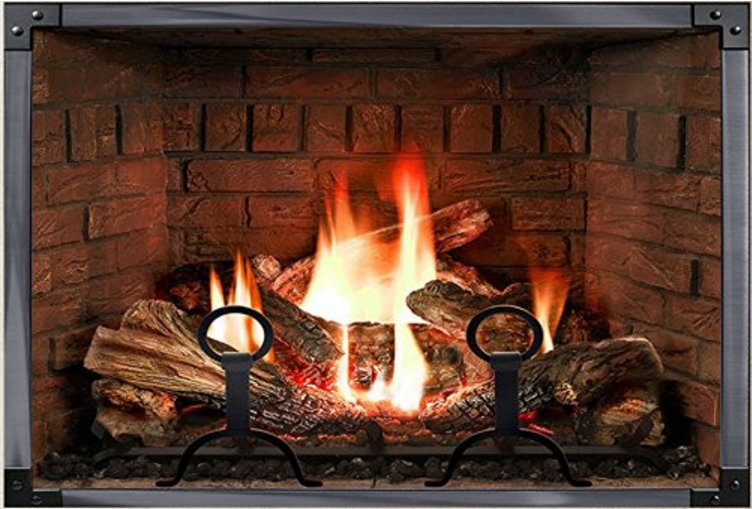 The N1239 Vinyl Sticker Fireplace is 28 inches wide and 22 inches tall. 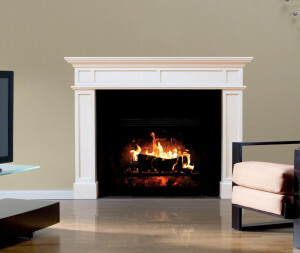 The mantel surround is an off-white and frames and arched firebox. Like the vinyl fireplace decal number N1239 but want it in a darker, oak style? 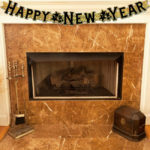 The N1241 Vinyl Sticker Fireplace has a natural, medium wood tone. It, too, is 28 inches wide and 22 inches tall. 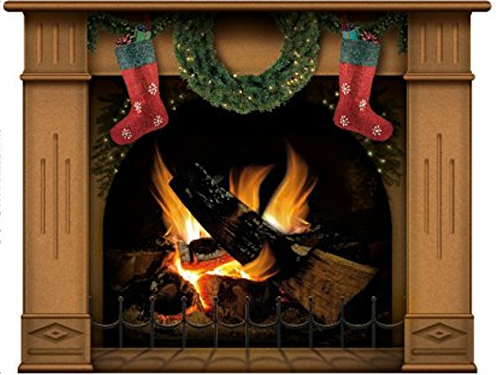 Identical to the preceding fireplace decal with the exception of the addition of greenery and two stockings, the Christmas Decorated N1241 Vinyl Sticker Fireplace is for those who want their Christmas fireplace complete. Again, it is 28 inches wide and 22 inches tall. 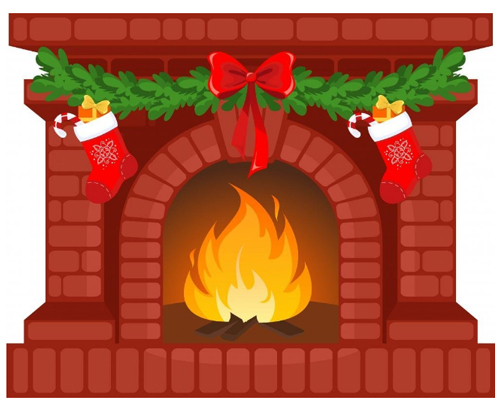 If you are looking for a fireplace decal with a less realistic and more whimsical take, the Wallmonkeys Christmas Fireplace Decal has that Disney-esque quality that often appeals to children. This decal is also small: 24 inches wide and only 22 inches tall. Since it is small, it is works in a little child’s bedroom. These posters focus on the fire more than the fireplace. They do not show the area around the fireplace (the fireplace surround) or a mantel. Because they are posters, they will need to be attached to a wall. 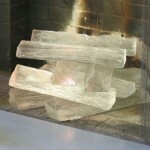 Another option is to place them over the firebox of an unused fireplace. If you never intend to light your fireplace, but would like the look a a blazing fire nonetheless, a fireplace poster is a great option. Printed on high quality, photo gloss paper canvas, this Realistic Fireplace Poster is available in a 24″ by 18″ or 36″ by 24″ size. 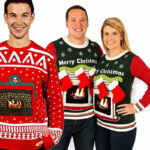 Attach it to the wall or place it over the opening of a real but unused fireplace. 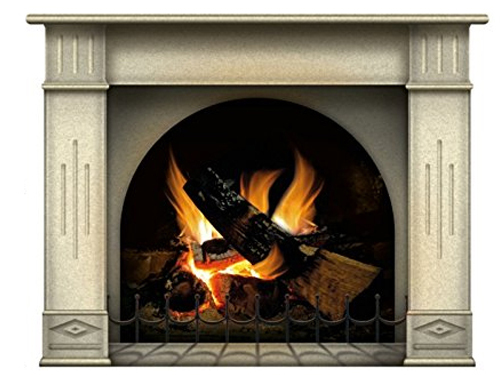 This Extra Large Fireplace Poster is 47 inches wide and 32 inches tall. 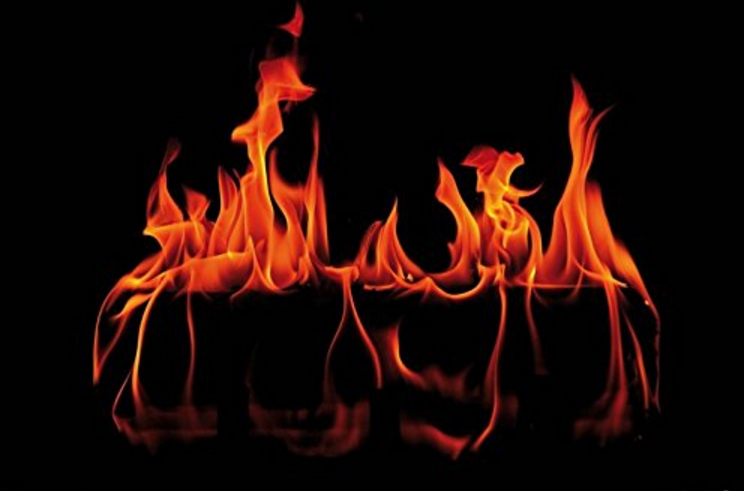 It is a photo-realistic image of the fire in a fireplace. 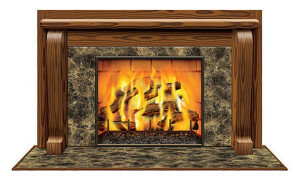 The Shindigz Wood and Marble Fireplace is a huge 5 feet, 2 inches wide and 3 feet, 2 inches tall. A 3-dimensional cardboard fireplace, 2-dimensional free-standing cardboard fireplace, vinyl peel-and-stick fireplace wall decal, or poster of a fireplace fire are all ways to add an instant fireplace to your home. Create a place to hang those Christmas stockings or to take Christmas photos in front of. And when the holidays are over (or better yet, when you get a real fireplace), these can be put away to be reused another year or another place. Last updated by Susan at November 16, 2016 . Fireplace is a must be thing in every house. It’s sign of cosiness, comfort and warmth. But I don’t like these cardboard fireplaces, they look unnatural.